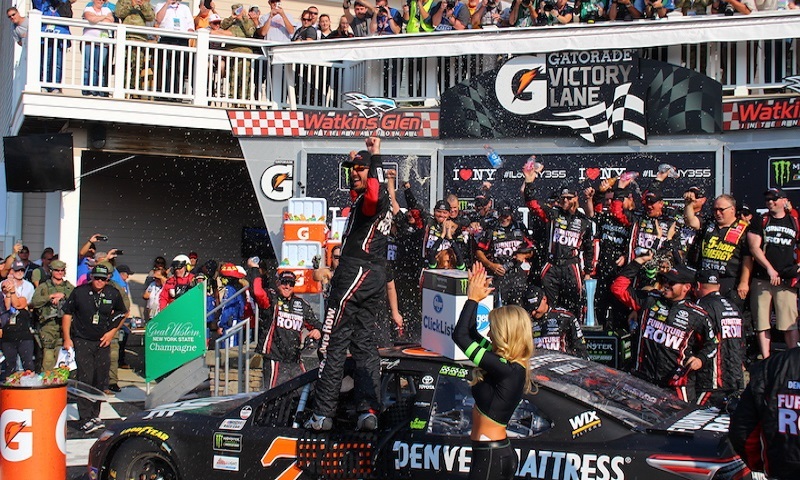 WATKINS GLEN, N.Y. –Stage racing and fuel strategy created a veritable maelstrom of a conclusion to Sunday’s I Love New York 355 at Watkins Glen Int’l, with Martin Truex Jr. saving just enough fuel to notch his fourth Monster Energy NASCAR Cup Series win of the season. With the final 36 laps running uninterrupted, Truex played a high-speed game of cat and mouse, as he let drivers go while he was saving fuel and then passed them back as they ran their tanks dry in the final moments. Ultimately Truex took the top spot for good with three laps remaining, pouncing as Ryan Blaney ran out down the backstretch and then holding off a hard-charging Matt Kenseth to secure the victory by .414 of a second. Truex now has 11 career Cup victories at 10 different race tracks, with nine of those wins coming since he joined Furniture Row Racing prior to the start of the 2015 season. Sunday’s win was a special one for Truex, who watched many of his “heroes” wheel Busch North (now K&N Pro Series East) cars around the historic course in his youth. Truex gave up the lead to Brad Keselowski with 14 laps to go entering the inner loop, as he had to save fuel to cover his team being two laps short on gas. Keselowski’s Team Penske machine was six laps shy at the end and was not planning to try and defy logic to nurse his Miller Lite Ford home. Blaney also got by Truex, taking the second spot with eight to go, but he too did not have enough gas to make it to the end and would eventually surrender position.